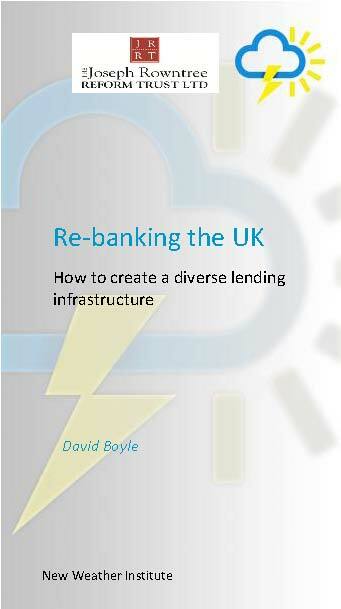 Our associate David Boyle has been working with Baroness Kramer in the House of Lords (before she went into government) to develop implementable approaches to creating a new local banking infrastructure in the UK. • The big banks bad at assessing and pricing the risk of lending to small businesses, and are consequently no longer geared up to do so. • Competitor countries have small banks. In the UK, just 3 per cent of banks are local, 34 per cent in the USA, 33 per cent in Germany and 44 per cent in Japan (and they all have better SME track record). • Co-operative and savings banks reduce the drain of capital from urban centres and foster regional equality because of their ability to lend to SMEs. See the recent report on stakeholder banks. • Our lack of local banks means that our recessions are likely to be deeper than theirs, and our SMEs are at a disadvantage. There are short-term policies we need to tackle this, including hiving off more regional banks from RBS. There are long-term policies we need to make it easier to start local banks, and to create a legal structure for a co-operative bank (still not legal in this country, the Co-op Bank is just owned by a co-op, or it was). But the most important shift we need to make is to accept that the big banks no longer have the infrastructure for lending to small business effectively. The idea would be to use the postcode lending data to calculate what they owe to fund a local lending infrastructure to lend where they are unable to. This would be a version of Project Merlin which actually works, and it may be possible without legislation – though the threat of legislation would help – because it offers one huge benefit to the banks: an end to the argument, once and for all, about whether they are lending enough to small business. what’s the benefit of re-bank? Benefits are a more effective banking system that is able to recycle local savings into local investment, using local knowledge.